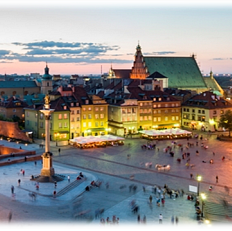 Warsaw as a destination is first and foremost a thriving capital city. It is also a perfect embodiment of the changes that have taken place in Poland in the last 20 years. It is a city of many faces – a contrasting blend of historical buildings, neighbouring post-modern skyscrapers and cosy cafes. Warsaw is a city of contrast and this is reflected in the variety of venues the city has to offer - from brand new, modern exhibition centres to historic 17th century palaces. Take your delegates on a Communist Warsaw Tour to allow them to really see the city in all its glory and learn a great deal about its history. Guests will board one of the vintage buses from the 1950s and immerse in a voyage in time into the beginnings of socialist buildings erected after WWII. Some of the venues that are on offer in this city include the EXPO XXI Warsaw. This is a state-of-the-art exhibition and conference venue in the heart of Poland's capital. It was opened in September 2001 (with Hall 4 added in 2009) and is a popular location for trade fairs, exhibitions, conferences, conventions, seminars, large-scale receptions, fashion shows and concerts. The use of advanced technology and technical solutions means EXPO XXI is ready to support even the most technically challenging events and guarantee the highest level of quality. Another amazing venue in Warsaw is the Hilton Warsaw Hotel & Convention Centre which boasts the largest hotel convention and event facilities in the heart of Warsaw, with a total of 32,290 sq. ft. (3,000 sq. metres) of flexible meeting space. This fully-equipped and versatile space can host an array of events, from board meetings and birthday soirees to concerts and exhibitions. The impressive pillar-less Warsaw Hall can comfortably accommodate 1,600 delegates in theatre-style and is complemented by an elegant foyer.